New Colorado Coach Says The Buffaloes Will Win "Eventually"
Every morning, the fine folks at Sports Radio Interviews sift through the a.m. drive-time chatter to bring you the best interviews with coaches, players, and personalities across the sports landscape. Today: A stirring prediction from Mike MacIntyre. 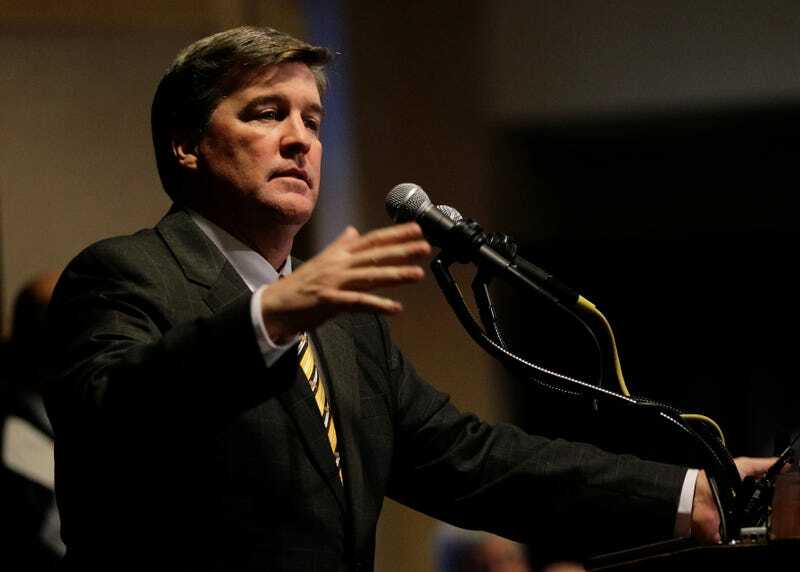 Mike MacIntyre joined KKFN in Denver with The Drive to discuss how soon he can make Colorado football relevant again, the process to landing the job, if he's been given a sense of how long he has to turn things around and the philosophies that helped him do just that at San Jose State. How soon can you see Colorado again becoming relevant nationally? "As a coach, you hope tomorrow, but it's going to take a process. It's going to take a perseverance by us in implementing our program and just keep working it. At San Jose State, when I was there, we had been down for a while, and my first year wasn't very good. But then we turned it, and we went from 120th in the country to 24th in the country in about a two-year span. That's just a process of getting great young men there that want to be successful in the classroom, off the field and on the field and kind of have a chip on their shoulder." What was your reaction when you got the phone call from CU and you realized you were being considered a candidate for the job? "I think it was probably [everything]. I was honored, I was excited, and then we were right in the middle of a big recruiting weekend coming in, so I had a lot of things on my mind. … I wanted to have time to talk to the family and kind of process it and then I met with everyone … and started working through the whole process. But I definitely was excited about maybe having an opportunity, but I know there's other people involved with the job and that type of thing." Given the short window that Jon Embree had to try and turn the program around, what kind of assurances have you been given in how long you'll have to build the program up? "Just the assurance that we keep showing improvement, keep working like any coach. I don't know that there's ever a timetable in college football and football. You need to keep showing an improving product on the field, and then all of the sudden your wins start happening and it's starts clicking. Of course you want to do it sooner than later, but I'll just keeping working the process that I've put in place. … This is a tough, tough conference, but I think it's something that we can definitely work through and be able to be very successful." Have you had a chance to look at your new team on film? "I haven't looked at any CU tape. The only CU tape I watched was last year, we played Colorado State and beat them 40-20 after CU played them. That's the only tape I saw there. Turnovers, to me, is what cost CU in that game. That turnover at the end of the half there, where they fumbled the ball, I think on a punt return … that was really a huge play in the game." "I truly care about young people; I really do. It's really important for me that these young men grow into the type of fathers and husbands we'd want them to be. … Then, winning a lot of football games. I love those guys at San Jose State, and they know that - they truly know that. We helped that place improve; we left it better than when we came to town. And those young men will grow from that and I'll have lifetime friendships with those young men. And that's what I plan on doing here. … If you feel good about yourself and doing the right thing, you'll be more successful at your job and you don't have a whole lot of strings pulling you. … We'll eventually win, and I can't tell you when, but I know we'll eventually win, and we'll be winning all around." • The Heat aren't where they'd like to be. • The Dodgers are going to be expected to win every game next season. • The Rangers claim they've not bitter about Josh Hamilton's departure.